Bandits, Genesis plan Community Day Saturday, Jan. 31, at 9 a.m. The Quad Cities River Bandits and Genesis Health System are inviting the Quad Cities community to join their team to protect the community from seasonal influenza, and to build a lineup that will make another memorable season for guests at Modern Woodmen Park. Community Day on the morning of Saturday, Jan. 31, will include 500 free vaccinations to protect against seasonal influenza, the River Bandits' annual job fair, and auditions for national anthem singers. The Genesis Flu-Free Quad Cities program - which the River Bandits and Main Street Amusements supported as part of a $50,000 donation to the Genesis Health Services Foundation in November - has provided flu shots to about 48,000 Quad Cities adults and children since the fall and protected thousands more indirectly. Nearly 9,000 elementary school children received free flu shots at their schools this fall. "The River Bandits and Main Street Amusements have been proud to partner with Genesis Health System to make the family-friendly fun of Modern Woodmen Park become a positive and lasting impact for our community with programs such as Genesis Flu-Free Quad Cities," said River Bandits owner Dave Heller. "Community Day continues our strong partnership to provide fun, health and wellness to entire Quad Cities region." The doors will open for all Community Day events at 9 a.m. Saturday, Jan. 31. All events will be on the suite level of Modern Woodmen Park. Information about each event are listed below. Complications from seasonal influenza can be fatal for as many as 30,000 nationally in a single year. The youngest, the oldest and those with chronic conditions are at highest risk for serious complications. Each person who receives seasonal influenza vaccinations is believed to protect five people around them, including higher-risk individuals. Genesis will also host a throwing clinic to prevent injuries in young baseball and softball players; free blood pressure checks; and a jump analysis for kids. The Quad Cities River Bandits, Main Street Amusements and Professional Sports Catering, the food and beverage provider at Modern Woodmen Park, are seeking outgoing, hard-working, fun-loving, friendly people to assist fans and be a part of the team that will help make another memorable season for guests at the ballpark. 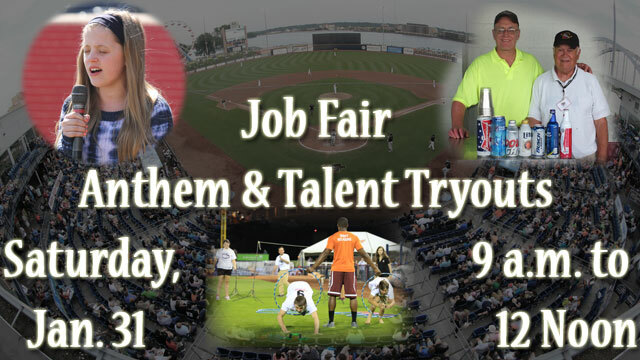 The River Bandits, Main Street Amusements and Professional Sports Catering will host a job fair on Saturday, Jan. 31, from 9 a.m. to noon at Modern Woodmen Park to fill the ballpark's game day staff and food and beverage positions. Interested individuals can fill out an application and be interviewed on the suite level during the job fair. The River Bandits, Main Street Amusements and Professional Sports Catering are equal opportunity employers; women, minorities and U.S. veterans are encouraged to apply. The River Bandits will hold tryouts on Saturday, Jan. 31, from 9 a.m. to noon for individuals and groups, including National Anthem singers, to perform and entertain fans with their talents prior to home games during the 2015 season. National Anthem and other pre-game performance tryouts will take place in the Budweiser Champions Club at Modern Woodmen Park. Registration is first come, first served. Talents can range anywhere from singing, dancing, and comedy to miming, juggling or magic. Everyone participating in the tryouts will perform their talent for a panel of River Bandits staff and local judges. Those talented enough to entertain crowds at River Bandits games this summer will be included in the show during the 2015 season. Fans may learn about ticket plans and group outings, and purchase or renew ticket packages for the 2015 season. For children ages 14 and under, the River Bandits will offer another one-day special on 2015 Kids Club memberships. Normally $30 per child 14 and under, a membership will be $25 at Modern Woodmen Park on Saturday, Jan. 31. A Kids Club Membership includes a free bleacher ticket good for all River Bandits 2015 regular season home games, a membership card, a T-shirt, a 10 percent discount off purchases in the team store, an email newsletter with exclusive special offers and much more. UP NEXT: Call today to reserve a Valentine's Day dinner at Modern Woodmen Park for Friday, Feb. 13, or Saturday, Feb. 14. Couples can enjoy a gourmet four-course dinner in a private luxury suite or take in the spectacular views of the ballpark, its Ferris wheel, the Centennial Bridge, Mississippi River and downtown Davenport from a table in the glass-enclosed, climate-controlled Budweiser Champions Club. Reservations are due Monday, Feb. 9, by calling 563-324-3000.